I’m happy to see that Forbes contributor James Conca has taken on the central EROI issue — what John Morgan termed the The Catch-22 of Energy Storage. In today’s essay EROI — A Tool To Predict The Best Energy Mix Jim engages directly with the reality that affordable utility-scale storage does NOT make solar PV and biomass into big winners in the future low-carbon energy portfolio. Jim contributed an effective new chart that combines both the with-storage and without-storage EROI profiles. The dotted line at EROI = 7 represents an estimate of the minimum performance required to support a modern industrial society, as represented by the OECD countries. Both John Morgan and Jim Conca based their analysis on the important 2013 paper by Weißbach et al (ungated preprint) published in Energy, Volume 52, 1 April 2013, Pages 210–221. I want to emphasize that not only is this paper a major conceptual contribution to the energy policy, it is also a model of transparency. Included in the supplementals of the Weißbach et al. paper – are the spreadsheets containing all the materials reference data, assumptions and the EROI and EMROI computations. This means that any motivated reader can audit every detail of the energy inputs, material requirements and computations. If any reader objects to any of the assumptions they are free to amend the Weisbach spreadsheets to compute their own preferred EROI profiles. An excellent example of the transparency benefit of the Weisbach spreadsheet contribution is Keith Pickering’s GETTING TO ZERO: Is renewable energy economically viable? Keith used the Weißach model to analyze the progressively improving EROI of nuclear fission. With 100% centrifuge, nuclear will have an EROI of 106, EMROI of 166 according to Weißbach’s analysis. Here’s an earlier 8/13/14 Seekerblog post on the Morgan and Weißach work. Capacity factor of solar PV in Germany is 10%. Wind in Germany is around 16%. 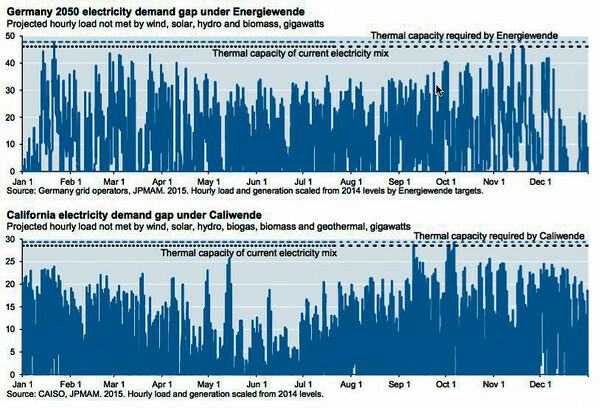 Electricity demand in Germany peaks in winter, when the capacity factor of solar ranges from 0% to 3%. These energy sources aren’t there most of the time, and certainly not when they’re needed most which is in the evening and winter. Brookings held the captioned event to launch a new policy brief (download PDF). I listened to the audio podcast while cycling Saturday. There is also a transcript available. When I study the Brookings graphic showing the fossil increases in Germany and Japan it makes me really sad. But the majority of citizens are happy that the hated nuclear is dead or dying. I think Germany is driving their economy off a cliff. As RE penetration increases their generation costs will go convex. Germany is already around 27% RE, with “greens” talking about going to 100% as fast as possible. But the man on the street thinks this is all grand. It is political suicide for a politician to propose reversing the anti-nuclear Energiewende. Brookings is a big place. 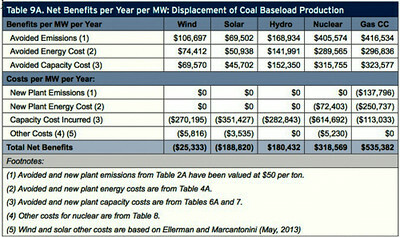 Evidently it's possible for the RE group to be unaware of other Brookings research just published in May this year “The Net Benefits of Low and No-Carbon Electricity Technologies” Charles Frank, summarized in the blog Why the Best Path to a Low-Carbon Future is Not Wind or Solar Power. This is a placeholder for a longer post when I have time to write it. Check out the audio or transcript and the brief. What do you think? Wind and solar cannot sustain an OECD level society. Adding energy storage buffers the variability, but further reduces the EROI below the economic limit. Therefore solar and wind can reduce the emissions of fossil fuels, but cannot eliminate them. They offer mitigation, but not replacement. If we want to cut emissions and replace fossil fuels, it can be done, and the solution is to be found in the upper right of the figure. France and Ontario, two modern, advanced societies, have all but eliminated fossil fuels from their electricity grids, which they have built from the high EROEI sources of hydroelectricity and nuclear power. Ontario in particular recently burnt its last tonne of coal, and each jurisdiction uses just a few percent of gas fired power. This is a proven path to a decarbonized electricity grid. But the idea that advances in energy storage will enable renewable energy is a chimera – the Catch-22 is that in overcoming intermittency by adding storage, the net energy is reduced below the level required to sustain our present civilization. I suggest you go straight over to Brave New Climate: The Catch-22 of Energy Storage. And follow the comments – there are already some excellent contributions and additional resource links. One important resource is included in the supplementals of the Weißbach et al. paper – that’s the spreadsheet containing all the materials reference data, assumptions and the EROI and EMROI computations. Total transparency — after several hours working through the spreadsheets I cannot find anything to criticize. If I do find some issues I’ll add updates here. Wind is a tricky case. If you ask most people, they will tell you that we don’t currently have energy storage for wind. In fact we do, but the buffering for wind comes from natural gas powerplants, which are typically built at the same time wind is deployed. When the wind dies, the backup gas plants are turned on, to keep the grid power reliable. Thus the energy storage for wind is embodied in the natural gas that isn’t burned when the wind turbine is producing peak output. This means that wind, as it’s used now in the US, isn’t really zero-fossil. It’s a hybrid system that’s part wind, part natural gas. And considering the availability of wind (30% is typical for a wind turbine), most of the energy actually comes from the fossil side of the equation. We’re using the wind to offset some of the CO2 emissions from the gas plant (which is good), but instead of getting to zero, we’re just walking toward the cliff instead of running toward it. Denmark currently is one of the most wind-energy-intensive countries in the world, which works because they buffer their wind energy against hydroelectric power from Norway and Sweden. When the wind is blowing in Denmark, they export electricity to Sweden, which then can turn down its hydro plants (thus keeping more water stored in the reservoirs behind the dam). When the wind dies, Sweden turns up the taps on the hydroelectric production, and exports that stored energy back to Denmark. It’s a great zero-fossil system, but it’s only possible because of the unique geography that places a flat windy country right next to a couple of wet mountainous countries. Finally, it’s important to note that the grid-buffering sources for wind (hydro in Denmark, gas in the US) both have a higher EROI than wind itself. Thus these hybrid systems do make economic sense, but that’s partly because the buffering portion makes economic sense on its own. Essentially, these hybrid systems dilute the EROI of hydro or gas, in order to subsidize the EROI of the wind portion of system. For the hybrid gas system that makes sense, because the reduction in CO2 is worth it. For the hydro-buffered system, the question is more problematic. In any case, it’s clear that if wind had to be buffered with a non-generating storage-only system, the economics would be difficult to justify. One reason previous studies on nuclear have been all over the map is that it’s a moving target: the EROI of nuclear has been rising rapidly during the past 20 years (and will continue to rise) as the industry switches from gas-diffusion enrichment of uranium, to centrifuge enrichment (which is 35 times more energy efficient). Since uranium enrichment is a major part of energy input, this makes a huge difference. 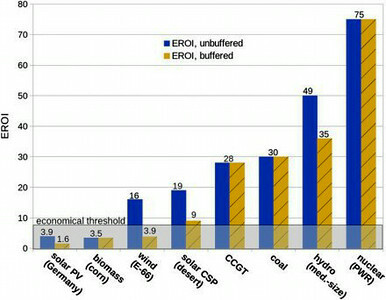 A nuclear plant using 100% gas diffusion would have and EROI of 31, EMROI of 34, comparable to coal. Weißbach’s numbers above are based on 83% centrifuge, 17% diffusion. The World Nuclear Association projection is that there will be no more diffusion enrichment anywhere in the world by 2017. With 100% centrifuge, nuclear will have an EROI of 106, EMROI of 166 according to Weißbach’s analysis. In other words, the switch from diffusion to centrifuge roughly quadruples the overall energy efficiency of nuclear power. Beyond that, there is a new laser enrichment process being developed called SILEX which promises to be 10 times more energy efficient than centrifuge. And even beyond that, some Gen IV reactor designs (the fast neutron reactor, and the liquid-fuel thorium reactor, or LFTR) don’t use enrichment at all, and could therefore come in at EROI of about 114, EMROI of 187. Keith used the Weißbach et al supplementary spreadsheets to do these calculations.